The Laundress, and the ladies who founded it, are hoping to change the way you think about your laundry and your dry-clean-only garments, for good. Their eco-friendly line of detergent, fabric care, and home-cleaning products are aimed to take excellent care of you, the things you love, and the environment. And here's the kicker; they actually work. 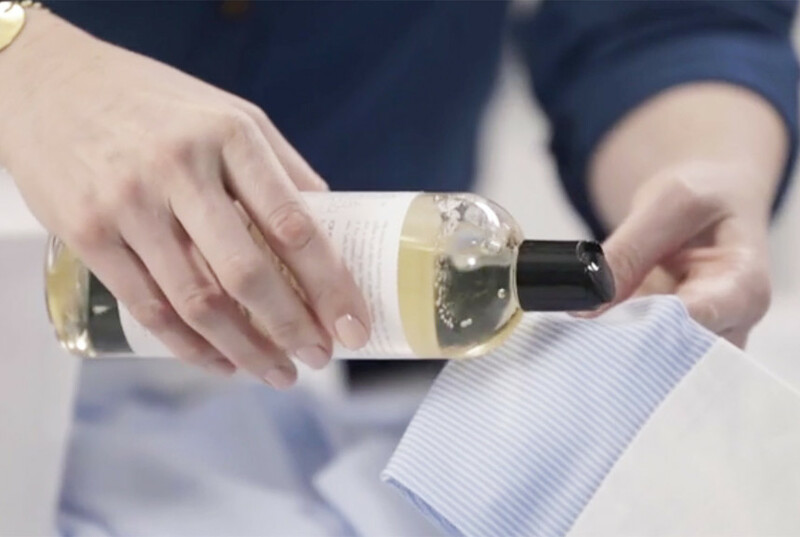 Unlike the low-concentrate and mildly-effective eco-friendly detergents on the market, The Laundress developed a formula that not only works better than those of the major name brands, but also takes better care of our clothes and our world. Since then, Gwen Whiting and Lindsey Boyd (the co-founders) have been on a mission to take care of every dry-clean only fabric and stain with solutions that keep your clothes looking and smelling their best. Curious about what this fabulous line of products can do for you and your clothing? Check out their how-to video below and shop every product they use, on SALE now for a limited time! Stain Solution: The Stain Solution is a unique, enzyme-based formula that handles any tough stain, including wine, tea, coffee and grass. Simply apply the stain solution directly to the stain, brush through, soak and wash like normal. Those impossible to get out stains become a thing of the past. All-Purpose Bleach Alternative: This non-abrasive All-Purpose Bleach Alternative has a unique formula that's designed to be gentler on the environment and fabrics than traditional chlorine bleach. And, unlike normal bleach, it can be used on garments of any color. Use it in combination with the Stain Solution to get out even the toughest of stains. Stain Brush: The Stain Brush will be your best friend when getting out any tough stain. It's made of natural horse hair, so it's gentle enough to never snag your clothing, but tough enough to brush out stubborn stains before and during soaking. Wash & Stain Bar: The innovative design of our Wash & Stain Bar allows you to use it on those tricky underarms of your favorite dry-clean only jackets and suit coats. It also works brilliantly to clean sweat-stained collars and delicate straps. It's a hero for spot treating clothing and upholstery, hand washing, and laundering on-the-go. For a complete wash; lather with water and soap on the entire item. For stains; lather with water and work the soap into stained area like in the above video. Wipe away excess soap if the garment can't be washed or launder as normal. Scented Vinegar: The Laundress Scented Vinegar does all of the powerful work of vinegar, without any of the smell. That means taking tough, baked-in smells out of clothing, stopping static cling in the wash and cleaning countertops and hardware around the house. True to their eco-friendly concept, The Laundress Scented Vinegar is 100% natural vinegar combined with their classic home scent, which is a wonderful blend of bergamot, thyme, lavender, musk and ylang ylang. Use this product everywhere and anywhere. We hope you've found a few new favorites of your own, or, at the very least have more hope to remove those pesky stains and say goodbye to the dry-cleaner for good!